contribute to the resolution of problems with the help of research activities conducted by public establishments. In abstract, the basic target of code-1007 program has been defined as supporting projects that can contribute to meeting necessities that may be removed, and to resolving problems with the R&D works of public establishments. Public establishments have speeded up their R&D activities in accordance with the aforementioned program. Within the scope of this program, Istanbul Culture University (ICU), jointly with the General Command of Mapping (GCM) and the General Directorate of Land Registry and Cadastre (GDLRC), has proposed to TÜBİTAK an extremely crucial project for Turkey. TÜBİTAK, and upon scientific assessment, has decided to support this nation-wide “Project of Research and Implementation Related to the Establishment of Networkbased Stationary Real-Time Kinematic (RTK) GPS Terminals and Determination of Cellular Transformation Parameters”. The project’s agreement was signed on April 18, 2006 by TÜBİTAK, ICU, GCM and GDLRC, and shall be concluded on April 18, 2008 (Figure). This project shall be abbreviated hereafter as CORS-TR Project. CORS-TR Project will be a pioneer application in our country, keeping in mind its research and development nature towards the formation of nation-wide engineering infrastructure, being carried out with the cooperation of TÜBİTAK, a University and two distinguished mapping establishments serving in the same sector. Geographic data plays an extremely crucial role in all kinds of spatial design, planning and applications, hand to hand with efficient usage of resources, in all organized societies. Cadastre and mapping works necessitate the usage of up-to-date geographic bases in order to manage and conduct all kinds of spatial works including structural and infrastructural ones. The rapid technological and scientific developments during recent years have enabled the digital storage of geographic data and the integration of relevant attribute data in computer environment. Geographical / Land Information Systems (GIS / LIS) evolved from the ability to evaluate and manipulate graphic and attribute data from within the computer environment. Nowadays, GIS / LIS became inseparable part of our life. Geo-information has a lot of uses. For instance, administration of state, forest, environment, and city planning, determination of land usage and agricultural policy, engineering structuring, evaluation of infrastructure and natural resources, multi-purpose cadastre, e-government, e-municipality, e-commerce, and all other activities that depend on spatial information, are just few examples. It is a must to determine the position (i.e. coordinates) using trustworthy methods, as it is the base in cadastre, mapping and GIS / LIS. Otherwise, problems of inconsistency and poor integration would be faced. The technology of Global Positioning System (GPS) has opened a new era regarding the determination of positions. Despite the fact that GPS technology has entered our country in 1990’s, public and private establishments are still using uneconomical old-fashion methods and techniques. That is where CORS-TR Project comes into the picture; targeting the substitution of old inefficient systems with a single, fast, efficient, economical, trustworthy and modern system that can serve nation-wide. Furthermore, this project will serve to determine the transformation parameters from old national datum of ED50 to current datum of ITRFyy, and to migrate all old data in ED50 into ITRFyy. As a result, each point will have one uniform and unique address (i.e. coordinates). Other terrestrial measurements for GIS/LIS applications. Such necessities will be met rapidly, economically and well with this project. For the sake of achievement of CORS-TR Project’s goals, the whole area of Turkey has been selected as Project Area, as this project from scope to content will open a new era in mapping and IT in our country, and will provide great facility regarding the usage of hightech tools thereafter. In summary; the aim of this project is fast, correct, and trustworthy collection of all kinds of geography-based field and field-related data, thus, speeding up the activities of cadastre, assuring organized urbanization, constituting the spatial infrastructure for relevant works of e-government, and monitoring plate tectonics. When the project concludes, we will have the ability to acquire coordinate information with cm-accuracy, any place and any time nation-wide, using a methodology regarded as highly economical when compared to classical ones, with 1 to 2-minute intervals. The relationships between ED50 and ITRFyy datums will be provided. In brief, CORS-TR Project will remove the necessity of ground construction in the field of mapping in our country to great extent; will provide the users with high-tech’s convenience and products. Currently, there exist more than 2000 GPS receivers in the entire country. These GPS users, benefiting from static or RTK (real-time) techniques, are forming their own base stations, and then computing coordinates with the use of rover receivers. In static measurements, depending on the baseline length and applied method, rovers are required to collect data for periods extending from 15 minutes to multiple hours. When using RTK, on the other hand, solution can be acquired up to 5-10 km from the base station (i.e. Figure 1). The points determined as a result of this troublesome and expensive approach are marked in the field with stones of different dimensions (including pillars). This project will provide the existing and new GPS receivers with the capability to determine coordinates faster, more economical and more accurate that before, thus increasing their efficiency largely. The CORS-TR Network approach will provide the capability to determine static and RTK positions with 1-2 minute intervals, if not down to mere seconds. When using RTK, solution will be provided up to 75 km away from the base station (i.e. Figure 2). Points determined with such easy and economical approach can be marked in the field with practical and cheap materials. Coordinates will be produced with a single national format and standard. Each reference station within CORS-TR system will hold the characteristics of CORS Network and will provide the capability of cm-level real-time positioning within its own “jurisdiction” area. The system, at the same time, will be web-based and will assist the users with data post-processing. The CORS-TR system will be integrated into Turkey’s National GPS Network (TNGN, known as Turkiye Ulusal Temel GPS Agi – TUTGA in Turkish) that has been established by GDLRC and GCM within ITRFyy datum. CORS-TR system design (See Figure 3). Determination of the requirements of communication and power (electricity, phone, internet...etc). Must have electricity and communication facilities. Must be capable of all kinds of communication (e.g. radio, GSM / GPRS, Thuraya, NTRIP, Internet...etc). Companies like Leica, Thales, Topcon and Trimble manufacture such systems. The realization of system selection will be done upon objective criteria, such as: technical capability of receiver, manufacturer’s competence and support, price...etc. option of establishing local centers will be assessed, within the scope of project. For the sake of communications, RTCM 3.0 and more advanced protocols will be used, thus radio, GSM, GPRS, NTRIP (Network Transport of RTCM through Internet Protocol) communications will be assured. Within this context, study will be conducted over the nation-wide coverage of GSM (i.e. Turkcell, Telsim, Avea...etc.) to exactly determine its extents, and areas out of GSM coverage will be inspected for Thuraya coverage. All activities of this section are planned to conclude by the end of 2006. At first stage, areas thought for CORS-TR stations are roofs of sound public buildings, areas of meteorology stations, and other safeguarded and communicationequipped areas. Upon the conclusion of CORS station constructions, receivers will be setup and installed and CORS-TR will start to serve. As mentioned above, all data will be automatically gathered at one control center, which will provide the services of post-processing, DGPS and RTK to all users. During stage of project initiation, the CORS-TR control center will be established in Istanbul, within ICU, where the system will be brought to full-activity status. Similar centers will be established at GCM and GDLRC. All activities of this section are planned to conclude by the end of March 2007. Until recently, datum of (Mesedag originated at Ankara) had been used and all geodetic networks, maps and measurements had had been produced in it. The National Geodetic Network (NGN: Ulusal Jeodezik Ag - UJA) works were conducted by GCM during the years of 1950-1954, and densification activities took place later on to result in 449,215 points. Due to available low-tech at those days, established NGN had 1/100,000 – 1/50,000 (10-20 ppm) relative precision (i.e. errors of 1-2 m are possible in 100 km baselines). Because the precision of NGN is way behind precision provided by modern technology, GDLRC and GCM established TNGN (i.e. TUTGA) during the years of 1997-2001, constituted of 594 points. GCM carried out the necessary computations of TNGN, getting the points’ coordinates and velocities in ITRF (i.e. International Terrestrial Reference Frame). The relative precision of the network and the precision of point positions were found to be 0.1-0.01 ppm and 1-3 cm, respectively. km spacing, a nation-wide methodology (e.g. linear regression, minimum curvature surface...etc.) will be adopted and used upon the conclusion of R&D works of project team. Research and development of models to transit from ED50 datum to ITRFyy datum. It will constitute a foundation for all geo-information technologies, nationwide; map production, cadastre, engineering measurements, infrastructure measurements, planning, environment, transportation, e-government, emunicipality, e-commerce...etc. Hundreds of users, nation-wide, will work without the necessity of looking for local reference control points, which will tremendously increase the work efficiency; in some developed countries, one stationary base station is used by tens and even hundreds of rover stations, within their national networks. A nice example of the impact of this project would be the budget allocated by GDLRC, ILLER Bank, MUNICIPALITIES and other public establishments during the year 2005, in excess of 50 millions US Dollars, for the activities of geodetic networking. When this project is over, great savings in money and time will take place. When this project concludes, many high-tech activities like DGPS and Vehicle Tracking will benefit from it. Another important issue: establishments that produce maps of big scales like GDLRC and ILLER Bank will be able to transform their data easily, and great window of opportunity will be opened for the realization of various projects of Geographic Information Systems, Land Information Systems, and Registry & Cadastre Information Systems. 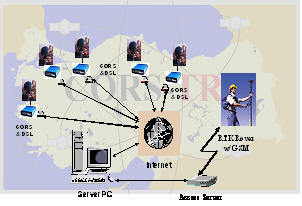 CORS-TR system will be used in projects of planning, infrastructure, municipality, vehicle tracking, agriculture, forestry, GIS/LIS...etc outside GCM and GDLRC. This system will be highly beneficial for measuring Ground Control Points necessary for the operations of photogrammetric map production, ortho-rectification, ortho-photo production...etc. GDLRC will guarantee great savings in time and cost regarding its geodetic activities. For instance, the budget allocated for the year 2005 for such activities was around 20 millions US Dollars, the majority of which would have been saved had this system been ready. GDLRC will be able to conduct its cadastral works in a much better fashion, with higher quality, less cost and faster execution speeds. GDLRC will be able to acquire the necessary information for TAKBIS to conduct coordinate transformation, and to gather new data. This project, to be realized through the partnership of ICU, GCM, and GDLRC, is highly relevant to all public and private establishments and individuals who deal with geographic data. That is why, and since the starting point of the project, relevant info, idea, and recommendations of our colleagues are highly appreciated. Through the period of the project three assemblies will be held, the first of which was on May 15, 2006 at ICU’s Ataköy Campus.